"Not a single scientist in the meeting believed a word of what I said. Now, I know I am right." Hermann von Helmholtz (1821-1894), upon returning to his laboratory after giving a lecture on his latest theories. Listed and explained below are some of the major hypotheses, with the publlication citations, that resulted from research conducted at OMLAB. Many of them remain viable hypotheses, i.e., they were supported by subsequent research, whereas, some (those followed by "*") were disproved by subsequent OMLAB research. Both the saccadic and pursuit systems function normally in CN. An internal monitor of efference copy is necessary for CN. CN is superimposed on both the saccadic and pursuit outputs. Corrective saccades require an internal monitor of efference copy. Glissades are monocular corrective eye movements. CN may be due to a high-gain instability in the smooth pursuit system. Smooth pursuit is ipsilaterally controlled. CN oscillates away from and back to the intended line of fixation. CN is caused/intensified by fixation attempt. Schizophrenics do not have a basic pursuit deficit. The OKN asymmetry in INO is due to superposition of the slow adduction saccades and the oppositely directed slow phases. PAN is due to a time-varying neutral/null zone. There is considerable variability in saccadic velocity-amplitude relationships. All CN is due to a motor instability. Saccadic pulses are responsible for the abduction "nystagmus" of INO. All saccades are generated by the same mechanism. New visual information is continually available to alter the latency or cause cancellation of a saccade. An internal brain stem monitor (efference copy) mediates corrective saccades. There are 12 CN waveforms: pendular (P), asymmetric pendular (AP), pendular with foveating saccades (Pfs), jerk (J), jerk with extended foveation (Jef), pseudocycloid (PC), pseudojerk (PJ), pseudopendular (PP), pseudopendular with foveating saccades (PPfs), triangular (T), bidirectional jerk (BDJ), and dual jerk (DJ). Most jerk CN slow phases are increasing-velocity exponentials. The goal of individuals with CN is prolonged foveation. Periods of extended foveation are due to the fixation mechanism. Foveal function is indicated by bias reversals (jitter). "Braking" saccades may serve to brake a runaway SEM. There is a local, resettable neural integrator in the saccadic pulse generator that is distinct from the common, non-resettable neural integrator responsible for maintaining eye position. The common neural integrator is controlled by a feedback loop comparing its output to desired eye position; it can therefore ignore pulse-generator pulses that would increase its output beyond its desired value. The Anderson-Kestenbaum surgery has secondary effects: null broadening, off-null damping, and damping at the null. LMLN slow phases are linear or decelerating. LMLN is caused by egocentric confusion. 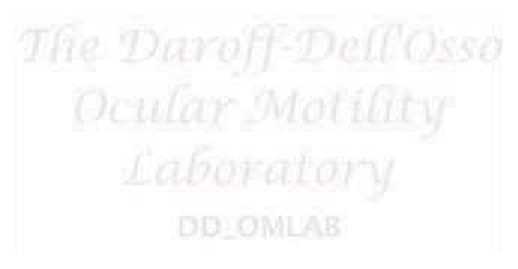 (Dell'Osso, L. F., Schmidt, D., & Daroff, R. B. (1979). Latent, manifest latent and congenital nystagmus. Arch Ophthalmol, 97, 1877-1885. Strabismus is a necessary condition for LMLN. Early strabismus surgery may convert MLN to LN. Smoth pursuit is normal in CN. During pursuit, the CN neutral zone shifts in a direction opposite to the pursuit. Ocular dominance is genetically predetermined and independent of early visual experience. Sensory feedback of eye motion can be used to damp CN. (Dell'Osso, L. F., & Leigh, R. J. (1990). Foveation periods and oscillopsia in congenital nystagmus. Invest Ophthalmol Vis Sci, 31, 122. (Dell'Osso, L. F. (1991). Eye movements, visual acuity and spatial constancy. Neuro-ophthalmol, 11, 151-156. CN is not caused by a primary fixation deficit. The CN neutral-zone shift during pursuit is an asymmetric function of eye velocity. The CN neutral-zone shift during VOR is similar to that during pursuit. Excess positive feedback in the neural integrator does not cause the accelerating slow phases of jerk waveforms in CN. The ocular motor system is organized on an individual eye (muscle) basis. CN can be damped by use of afferent (electrical or mechanical) stimulation of the forehead or neck. The best-corrected visual acuity in CN (LN etc.) can be determined by use of waveform characteristics in the NAF. The fast phases of LMLN may be either foveating or defoveating. The same criteria for high visual acuity apply to LMLN as to CN. OSOP is determined by ECPY and not by foveation periods. Achiasma alone may cause see-saw nystagmus. (Dell'Osso, L. F., & Williams, R. W. (1995). Ocular motor abnormalities in achiasmatic mutant Belgian sheepdogs: Unyoked eye movements in a mammal. Vision Res, 35, 109-116. Dell'Osso, L. F. (1996). See-saw nystagmus in dogs and humans: An international, across-discipline, serendipitous collaboration. Neurology, 47, 1372-1374. Dell'Osso, L. F., Williams, R. W., Jacobs, J. B., & Erchul, D. M. (1998). The congenital and see-saw nystagmus in the prototypical achiasma of canines: comparison to the human achiasmatic prototype. Vision Res, 38, 1629-1641. CN is an instability waiting to happen since it is an exacerbation of the normal ocsillatory behavior of the horizontal (more than the vertical) smooth pursuit system. Hemichiasma may also cause see-saw nystagmus. (Dell'Osso, L. F., & Daroff, R. B. (1998). Two additional scenarios for see-saw nystagmus: Achiasma and hemichiasma. J Neuro-ophthalmol, 18, 112-113. Simple dissection and suture (four-muscle tenotomy) can damp CN. Tenotomy effectively reduces the small-signal gain of the ocular motor plant. The extraocular motor tendons contain the neural substrate for a tension-control feedback loop. (Dell'Osso, L. F., Hertle, R. W., Williams, R. W., & Jacobs, J. B. (1999). A new surgery for congenital nystagmus: effects of tenotomy on an achiasmatic canine and the role of extraocular proprioception. J AAPOS, 3, 166-182. Dell'Osso, L. F. (2002). Development of new treatments for congenital nystagmus. In H. J. Kaminski & R. J. Leigh (Eds. ), Neurobiology of Eye Movements. From Molecules to Behavior�Ann NY Acad Sci 956 (Vol. Ann NY Acad Sci 956, pp. 361-379). New York: NYAS. Hertle, R. W., Dell'Osso, L. F., FitzGibbon, E. J., Thompson, D., Yang, D., & Mellow, S. D. (2003). Horizontal rectus tenotomy in patients with congenital nystagmus. Results in 10 adults. Ophthalmology, 110, 2097-2105. An internal brain stem monitor (efference copy) is necessary for OM control in LMLN. An extended NAF (NAFX) can predict best corrected visual acuity across subjects. Most CN has a torsional component reflecting an additional plane of instability. Four-muscle tenotomy damps CN and SSN and possibly some forms of AN. (Hertle, R. W., Dell'Osso, L. F., FitzGibbon, E. J., Thompson, D., Yang, D., & Mellow, S. D. (2003). Horizontal rectus tenotomy in patients with congenital nystagmus. Results in 10 adults. Ophthalmology, 110, 2097-2105. An internal brain stem monitor (efference copy) is necessary for OM control in CN. Many CN waveforms reflect the effects of normal saccadic and fixation subsystem attempts to overcome an underlying pursuit-system oscillation (i.e., pursuit-system nystagmus). Four-muscle tenotomy also damps acquired nystagmus, improving visual acuity. Corollary: Four-muscle tenotomy damps acquired pendular nystagmus, improving visual acuity. Corollary: Four-muscle tenotomy damps acquired jerk nystagmus, improving visual acuity. The beneficial proprioceptive effects of tenotomy result from changes in the small-signal gain of the ocular motor plant; saccdes are not affected. Four-muscle tenotomy broadens the high-foveation-duration range of gaze angles. (Serra, A., Dell'Osso, L. F., Jacobs, J. B., & Burnstine, R. A. (2006). Combined Gaze-Angle and Vergence Variation in Infantile Nystagmus: Two Therapies that Improve the High-Visual Acuity Field and Methods to Measure It. Invest. Ophthalmol. Vis. Sci. 47:2451-2460. Individuals with INS are "slow to see," further reducing their visual function. Proprioception is responsible for the beneficial effects on INS of contact lenses, convergence, and tenotomy. (Taibbi, G., Wang, Z. I., & Dell'Osso, L. F. (2008). Infantile Nystagmus Syndrome: Broadening the High-Foveation-Quality Field with Contact Lenses. Clin. Ophthalmol. 2:1-5. Four-muscle tenotomy alleviates the "slow to see" problem in INS patients, further improving their visual function. Wavelet analysis is too insensitive to detect foveation improvements produced by INS therapy such as, the tenotomy and reattachment procedure. Smooth Pursuit accuracy and timing in INS are a function of target timing and foveation capability. 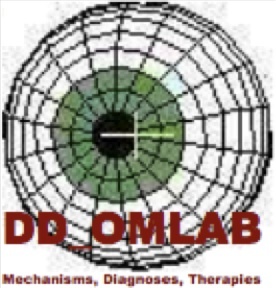 The ocular motor system may not have a sensitive period beyond which recalibration cannot be made. The NAFX may be extended to assess foveation capability in vertical and multiplanar nystagmus. The therapeutic effects of systemic acetazolamide on INS suggest action at peripheral as well as central sites. Loss of pursuit-system damping is responsible for both the pendular and jerk INS waveforms. A topical drug (brinzolamide) in the form of eye drops, can provide the therapeutic effects of tenotomy and reattachment on INS. Normal smooth pursuit may be impaired by target-motion timing and prior saccades. (Wang, Z. I., Dell'Osso, L. F., Prakash, S., and Chen, X. (2012). Smooth-Pursuit Changes after the Tenotomy and Reattachment Procedure for Infantile Nystagmus Syndrome: Model Predictions and Patient Data. Pediatr. Ophthalmol. Strab. 49:285-302. Additional tendon sutures in the tenotomy and reattachment procedure for INS do not improve its therapeutic effects. Corollary: Single tendon sutures alone may preclude the need for the four-muscle tenotomy. (Dell'Osso, L. F., Orge, F. H., and Jacobs, J. B. (2016). Effects of Augmented Tenotomy and Reattachment in the Infantile Nystagmus Syndrome. DJO 22:1-12.